In the days leading up to John Moran Auctioneers’ The Estate of Tammis Day auction, Moran’s office personnel was kept on their toes taking a record number of bids, answering questions, approving online bidders, and selling full-color catalogue books. Tammis Day (the daughter of Willametta (Keck) and Robert A. Day), was a woman of many passions and exceptionally good taste, and buyers came out in droves to participate in this highly anticipated auction. Tammis Day was a generous and life-long philanthropist, so it is only fitting that proceeds from the $1.1 million-grossing sale are to go directly to the Tammis Day Foundation, an organization supporting programs and projects furthering the fine arts and performing arts. Moran’s Estate of Tammis Day auction opened to a standing room-only crowd, and the attendance stayed strong throughout the entire 494-lot auction. The sale commenced with a champagne toast to Tammis Day led by one of her closest friends, and when the first lot opened, bidding immediately kicked off with heavy competition from telephone, floor and online bidders. A record number of bidders were approved on both the Liveauctioneers and Invaluable platforms (1345 and 3055, respectively). Operators of the online platforms also saw a record number of active, online bidders while running their systems. As a result of all the interest, prices were exceptional and no lot went unsold throughout the entire event, which began at 2pm and didn’t wrap up until approximately 10pm. Some of the projected highest-value items for the evening were part of Tammis Day’s collection of fine early 20th century lamps. A Grueby art pottery lamp designed by George Kendrick with its original hardware was brought to the block with an $8000/10,000 pre-sale estimate; thanks to interest online and from a handful of determined floor buyers, the Grueby lamp brought $28,125 (including Moran’s 25% online buyer’s premium; in house premium is 20%). A little later, a Handel lamp with a hand-painted art glass landscape shade was offered with a conservative $1500/2500 estimate; the piece brought an exceptional $6000, going to a telephone bidder. Tiffany lamps were also in high demand – two floral-motif examples, one “Spreading Daffodil” and one “Black-eyed Susan” were offered about an hour and a half into the sale (estimates: $15,000/20,000 and $8000/$12,000). Competition was fierce between online and floor bidders; the “Spreading Daffodil” lamp sold for $23,750 to a Liveauctioneers bidder, while the “Black-eyed Susan” went for $24,000 to a buyer bidding from the floor. Furniture and other household goods were also a large part of the estate and inspired just as much excitement as many of the higher-end objets d’art. Three pieces of handmade western furniture by Cody, Wyoming cabinetmaker John Gallis Norseman Designs West were offered – the most popular from the group proved to be a desk with an organic, curvilinear aesthetic, which sold for $4500 (estimate: $800/1200). Another hand-hewn piece, a koa wood chest signed only “Will”, was brought to the block with a conservative $500/700 estimate, and earned realized $4800 thanks to enamored floor and absentee bidders. Two pairs of floor standing Wilson Audio WATT and Puppy Series 8 speakers were offered and brought exceptional prices thanks to multiple telephone bidders; each set brought $6300 (estimate: $1000/1500). Collectibles and luxury items were also hot-ticket items, including rare first edition books, rock and roll memorabilia, and luxury handbags. A fine first edition copy of Bill Wilson’s Alcoholics Anonymous presented in excellent condition was sold for an astounding $13,200, well over the $600/900 pre-sale estimate. A small-scale signed photograph of Jim Morrison, offered at $200/400, opened with multiple bids online bringing the price over $1000 almost immediately; in the end, the autographed photograph realized $5400. Jim Marshall’s (1936-2010 Los Angeles, CA) silver gelatin print, “Jimi”, a 1967 photograph of Jimi Hendrix on stage, found a buyer for $2400, nearly twice the estimated $1000/1500. One of a handful of designer bags and clothing lots brought to the block, a Céline leather handbag in a cheery yellow colorway easily exceeded its $1000 to $1500 estimate, realizing $2125 thanks to online bidder participation. Art glass selections included a wide array of luxury glassware including glasses and barware by Hermes, Saint Louis, Baccarat, and Lalique. A group of Baccarat “Variations” champagne flutes with solid geometric stems and orange feet achieved an impressive $3750 price realized, well over the $1500/2000 estimate. Decorative art glass by various makers also did quite well, including a group of four art glass sculptures by artist Josh Simpson (b. 1949 American), including three spherical planet sculptures and one sculpture featuring lava-like Tektite glass; the group of sculptures brought $6000, going to one of a number of telephone bidders signed up to compete for the lot (estimate: $700/900). Tammis Day’s art collection was as wide-ranging as her interests; there seemed to be something for everyone among the curated selections. A few large-scale works by Provincetown, MA artist Anne Packard (b. 1933) were offered, including a charming oil painting depicting a beachside house atop a sloping sand-covered hill (estimate: $6000/8000). Telephone bidders were lined up days in advance to bid on the Packard works; the house on a hill brought $8400 including premium. In contrast, a small, painterly sketch of a cowboy on horseback by Los Angeles western painter Frank Tenney Johnson (1874-1939) was offered for $7000/10,000, earning $12,000 thanks to a collector bidding by telephone. A diminutive oil painting by French modernist Bernard Buffet depicting a black bird in profile achieved a $19,200 price realized, just within estimate ($15,000/20,000). Buyers were also delighted by the small selection of vehicles offered in the catalogue, which included a 1995 Ford F-150 truck in beautiful restored condition. The truck was expected to bring $20,000/30,000, and hammered for the high estimate, realizing $33,000 all-in. A 2009 Mercedes-Benz G-class G55 AMG RENNtech G600 inspired buyers to sign up to bid in droves, effectively filling up each of the ten available telephone bid lines; estimated to bring $50,000/60,000, the Mercedes found an out-of-California buyer for $66,000. A pair of beaded Plains Indian gauntlets once belonging to “Buffalo Bill” Cody and previously sold as part of the Buck Stevens collection opened at over twice the high estimate thanks to interest online; the framed gauntlets realized $4375 (estimate: $1000/1500). A Gibson 1959 Reissue Les Paul guitar, one of a nice selection of instruments, A/V and recording equipment within the catalogue offerings sold for $3900, twice the high estimate (estimate: $1200/1800). One of the most surprising highlights came early in the proceedings; a Russian propaganda porcelain figural group of Soviet riders on horseback was brought to the block with a very conservative $200/400 estimate. After opening on Liveauctioneers with a $10,000 bid, the figural group realized $15,000. A gorgeous 19th century brass-inlaid ebonized wood traveling artist’s box filled with silver and gold-adorned implements and engraved to the cover with the Imperial Crown of Russia by Parisian maker Alphonse Giroux & Cie. went home with an online bidder for $5937 (estimate: $1500/2000). Moran’s next auction is coming up quickly: the biannual California and American Fine Art Auction, is scheduled for Tuesday, October 24th. Comprising 200 lots, the California and American Fine Art Auction features pre 1940s California impressionist works alongside Modern and Contemporary compositions by well-known American artists. 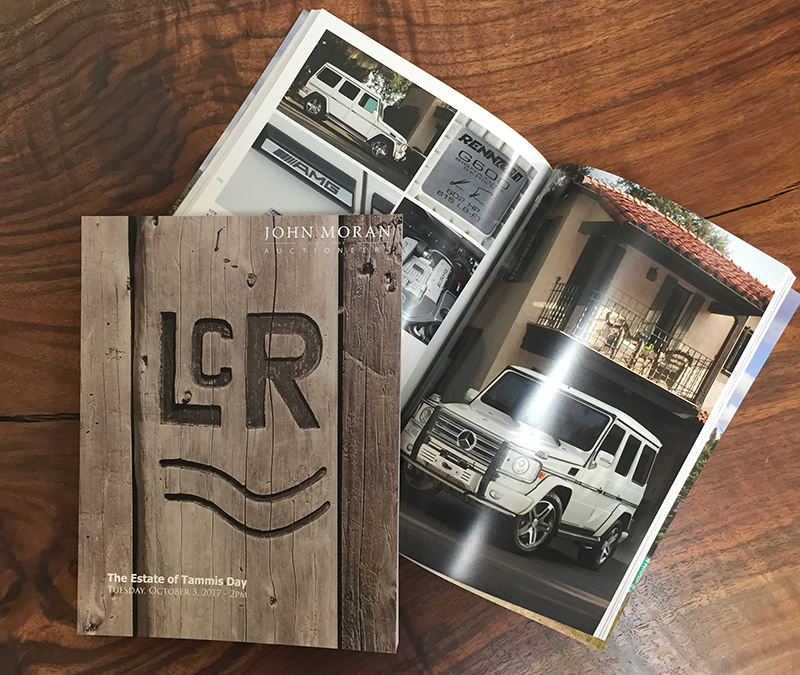 Browse the fully illustrated catalogue via John Moran’s website (www.johnmoran.com), or order the catalogue for $30 including shipping by calling Moran’s offices ((626) 793-1833). Moran’s auction schedule for the rest of 2017 has already been set; on November 14th, Moran’s will host a two-session curated auction. Totaling approximately 400 events, the November 14th sale will feature an Art of the American West session at 2pm followed by a 20th Century and Contemporary Design session at 5pm. On December 5th, John Moran Auctioneers will host a multi-session Jewelry auction (comprising Fine and Studio sessions), followed by a Traditional Collector auction session comprising Continental and Asian decorative objects and fine art. John Moran Auctioneers is currently consigning for all 2018 auctions; for consignment inquiries or more information regarding any upcoming auction, contact John Moran Auctioneers directly via email: info@johnmoran.com or telephone: (626) 793-1833.